The historic agreement between Ethiopia and Eritrea signed in September 2018, which kicked off the resumption of mutual diplomatic relations, was at the center of the conversation between Pope Francis and Abiy Ahmed Ali, Prime Minister of the Federal Democratic Republic of Ethiopia, received this afternoon in the Vatican Apostolic Palace. Francesco welcomed the premier directly in the private library, accompanied by a retinue of six people. The dialogue lasted about 15 minutes, in the presence of an interpreter. In a cordial atmosphere, as reported by a note from the Vatican Press Office, "the good relations between the Holy See and Ethiopia have been highlighted. Subsequently, important initiatives underway for the promotion of national reconciliation and for the full development of the country were noted. In this context - continues the statement -, we did not fail to highlight the role of Christianity in the history of the Ethiopian people and to enhance the contribution of Catholic institutions in the educational and health field ". "In the continuation of the talks - the Vatican note continues -, we focused on the regional situation, on the peaceful solution of conflicts and on the socio-economic development of Africa. In particular, there was talk of Ethiopia's commitment to the stabilization of the Horn of Africa, with special reference to the recent agreement and the resumption of diplomatic relations with Eritrea ». 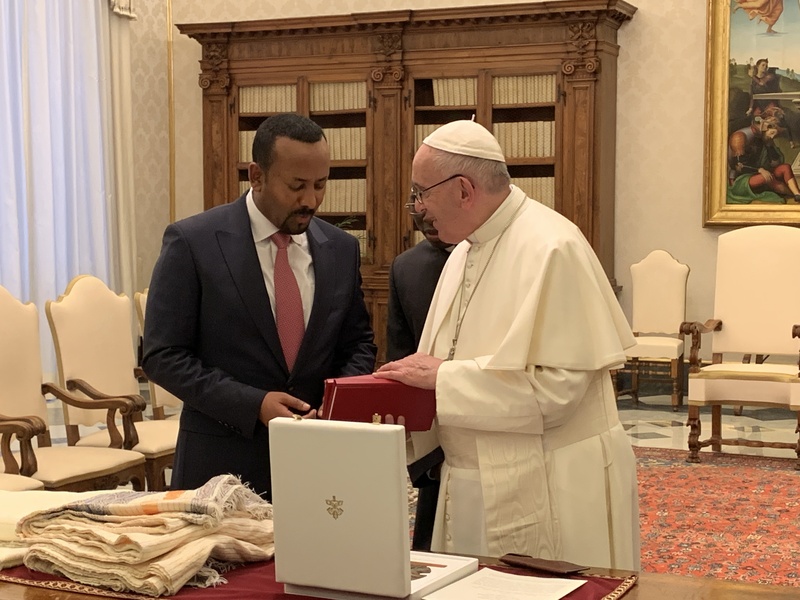 At the time of the exchange of gifts, Abiy Ahmed Ali donated to the Pope the fabrics typical of Ethiopia and a painting depicting the resurrected Christ. Bergoglio has returned with a medallion representing a desert on which a spike and a bunch of grapes stand out and he explained: "It is the prophecy of Isaiah and it means that one day the desert will become a garden". Also a gift from the Pope was his Message for the 2019 World Day of Peace signed and the four documents of his pontificate. At the end of the audience, the Prime Minister subsequently met with Cardinal Pietro Parolin, Secretary of State, accompanied by Monsignor Antoine Camilleri, Under-Secretary for Relations with States.